BOCA RATON, Fla. (AP) There were 28 voters in the Conference USA preseason football poll, and none picked Florida Atlantic as the team that would win the league’s East division. FAU coach Lane Kiffin has told his team that while external expectations are irrelevant, limiting internal ones would be foolish. His team apparently listened: In Year 1 of the Kiffin era, the Owls are on pace for their first bowl appearance since 2008 and a win over Marshall on Friday would keep FAU atop the C-USA East Division race. FAU hired Kiffin to make the Owls winners again. So far, so good. There is no crazy celebrating going on at FAU right now. When Kiffin was asked this week about the winning streak, he lamented how FAU let a game at Buffalo on Sept. 23 get away instead of puffing out his chest at winning four in a row. He’ll never be the super-serious type – college football’s Twitter king even tagged President Donald Trump in a post Tuesday , and fueled some Heisman talk about Singletary over the weekend in another post. 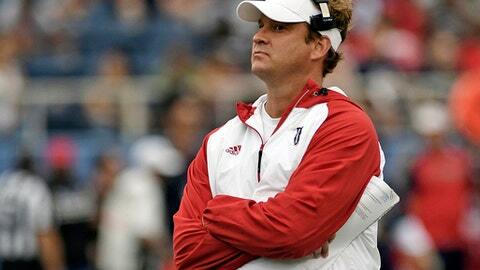 Kiffin acknowledged that he was merely doing some marketing. That being said, what Singletary – and his lightning rod of a head coach – is getting done is worthy of notice. ”When you lead the country in touchdowns, and we really didn’t give him the ball in the first two games hardly at all, it’s pretty impressive,” Kiffin said. Same goes for a lot of FAU’s numbers. Only eight teams have longer current winning streaks that FAU, which has won four in a row. The Owls are fifth in the nation in turnover margin, eighth in rushing offense at nearly 300 yards per game, ninth in red zone offense and 17th in total offense. After scoring 33 points in its first two games, both losses to Wisconsin and Navy, the Owls have put up an average of 47.1 points in their last six outings. ”I guess we’re doing something right,” Singletary said. The turnaround is obviously not complete, but FAU is clearly trending up – as would be expected when the Owls hired Kiffin. Of course, there was plenty of room for upward mobility. Out of the 129 programs with FBS teams since 2009, FAU is among the eight who hadn’t been to a bowl game. FAU went to, and won, bowl games in 2007 and 2008 back when the program was newly born under Howard Schnellenberger. Since then, the Owls have had five head coaches, zero winning seasons and a 33-71 record. But a win this weekend would bring bowl-eligibility, and C-USA title talk seems realistic as well – even while Kiffin is stressing process and patience.